President Jokowi takes picture with leaders of the FKUB at Bogor Presidential Palace, West Java, Monday (18/3). Photo by: Jay/PR. The Interreligious Forum for Harmony (FKUB) is ready to support a safe, peaceful, and harmonious election, according to its chairman Ida Pangelingsir Agung Putra Sukahet. 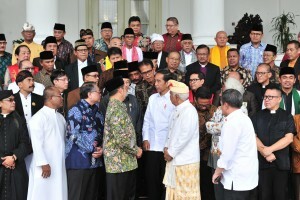 “We may have different choices or join different political parties, but we are always united in the spirit of brotherhood and the spirit of love as the fellow countrymen from Sabang to Merauke, from Miangas to Rote Island,” Sukahet told the journalists after a meeting between the FKUB leaders and President Joko “Jokowi” Widodo at Bogor Presidential Palace, West Java, Monday (18/3). Sukahet added that the FKUB has a moral obligation to support the election. “We support the election and also support maintaining the Unitary State of the Republic of Indonesia (NKRI) to remain harmonious, safe, and peaceful so that the President, Cabinet Ministers, Governors, Regents, and Mayors can develop this nation to be better,” he said. Sukahet went on to say that during the meeting, President Jokowi asked the FKUB to support combatting fake news, hoaxes, and slanders. “Our network reaches rural areas. 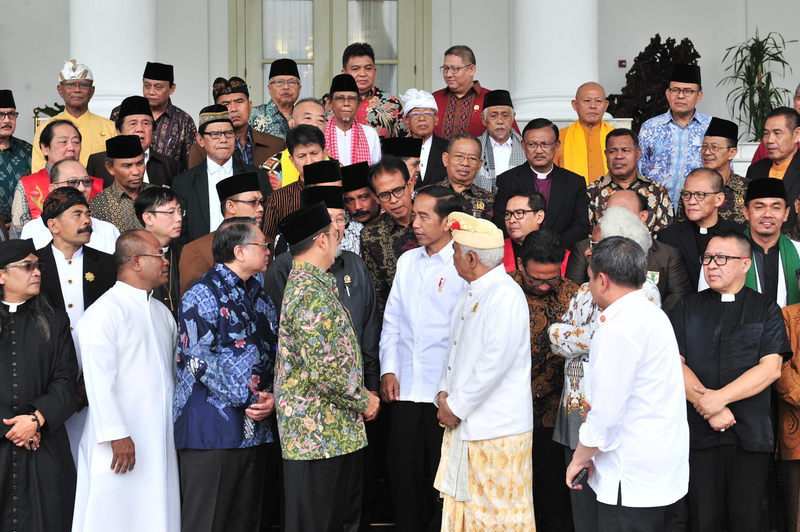 We have several religious associations such as the Indonesian Ulema Council (MUI), the Indonesian Parisada Hindu Council (PHDI), the Indonesian Communion of Churches (PGI), the Indonesian Buddhists Association (Walubi), the Confucian Supreme Council of Indonesia (Matakin), etc. We always preach the spirit of tolerance, togetherness, kinship, and we always invite (our members) to be good adherents of religion and good citizens,” Sukahet explained. He further said that during the meeting, the FKUB asked the President to improve the FKUB legal status from Minister Regulation-based to Presidential Regulation-based. “We are grateful for the response of the President, Minister of State Secretary, and Minister of Religious Affairs who has welcomed us. The drafting process of the Presidential Regulation is underway. (After the issuance of the Regulation) the FKUB will be entitled to receive funding from the State Budget and regional leaders will continue to support the needs of the local branches of the FKUB, “Sukahet said. He further said that during the meeting, the FKUB also reported to President Jokowi the results of its National Conference held last March in Makassar and invited the President to attend its upcoming National Conference to be held in April next year.